Fluctuating conditions within today’s housing sector have made it increasingly difficult for sellers to receive an offer that resembles their asking price. Despite the recent lack of inventory, prospective homeowners are reluctant to pay too much for any property that has been deemed less than desirable. That is to say, unless your particular house features amenities that others would be willing to pay more for, sellers will be hard pressed to match the asking price. Subsequently, owners that boast unique, in-demand features may become the beneficiary of an offer that exceeds their expectations. 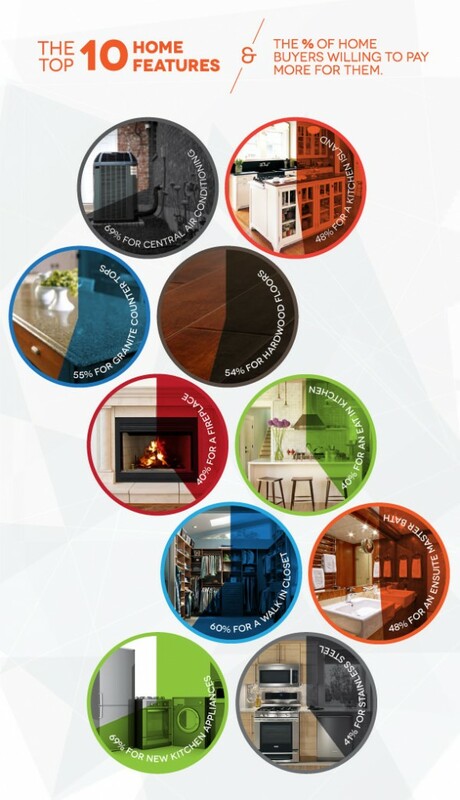 As a seller, it is up to you to take advantage of these home features and their propensity for additional value. According to a survey conducted by the National Association of Realtors (NAR), the majority of house hunters are willing to spend more money if it results in the acquisition of desirable home features. Of course, such amenities are not necessarily the most influential factors for prospective owners, Brendon DeSimone, a Zillow real estate expert acknowledges. The most important deciding factors are reserved for the location – proximity to good schools, neighborhood safety and resulting commute. However, statistics suggest that buyers are heavily influenced by ten specific upgrades. Their incorporation into a house will not only increase the buyer’s desire to purchase the property, but to increase their offer as well. The addition of these home features may facilitate a timely and profitable transaction for respective sellers. Take the time to familiarize yourself with the following home features if you are intent on selling your home, as they will provide instant value.